After a few revs of the engine, local artist David Crego brings his chainsaw down into the log, ripping and tearing through the wood. Each cut is as smooth as a painter’s brush stroke as he carves through the log, spewing sawdust and wood chips away from the saw in a geyser. A net hanging a few feet away keeps the chips from hitting passers-by. As Crego cuts, a small group gathers and he gives them each a nod and a smile when they stop, but he keeps sawing away at the log. When he finishes the log less than 40 minutes later, it’s in the shape of a jack-o-lantern. He places it next to the dozens of other wooden items he has for sale, including a variety of eagles, a cardinal, a bear, and Brutus Buckeye himself. The items range in price from $20 to $450. “I’ve been carving for 20 years, but I’ve only been doing it professionally for about seven years,” Crego said Tuesday before his carving demonstration at the Delaware County Fair. 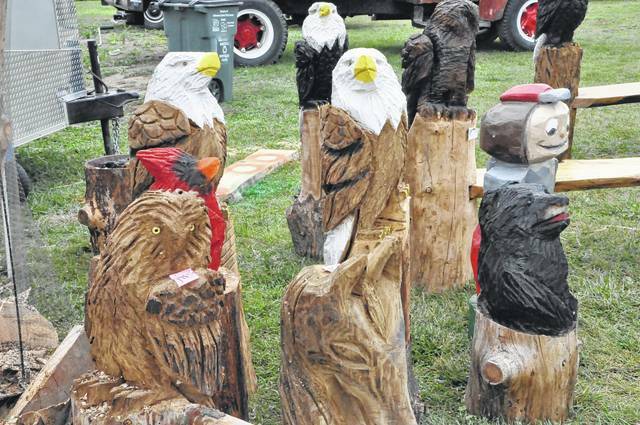 Crego, a Sunbury resident, said he used to sell firewood, but started carving professionally after attending the Paul Bunyan Show at the Guernsey County Fair a number of years ago. “I like [carving] more than firewood; it’s easier on me,” Crego, 46, said with a laugh. Crego said in those seven years he’s done everything from commissions to festivals and has even carved tree stumps into pieces of art on people’s lawns. Crego said he practices carving eight hours a day in his shop located at 9420 State Route 37 East in Sunbury. He said he doesn’t have to prepare too much before he begins carving. “I don’t draw much on nothing, I just visually look at the log and just do it,” Crego said. Though he’s from Sunbury and has attended the Delaware County Fair numerous times, 2017 marks the first time he’s attended the fair as a vendor, setting up a trailer, and performing speed carving for people. Crego was set up south of the coliseum Saturday through Tuesday, but will be spending the rest of the week just outside the fourth corner of the arena. Crego said that while he does sell items during the fair, he knows he is planting seeds in people’s minds for the future. Crego said if customers take care of them, his sculptures will last as long as any other piece of art. “It’s art. If you take care of it, it’ll take care of you,” Crego said. Crego said he was enjoying the fair Tuesday and was looking forward to the rest of the week. David Crego’s carvings range from bears to eagles to Brutus Buckeye and everything in between. Crego said he also does commissions. 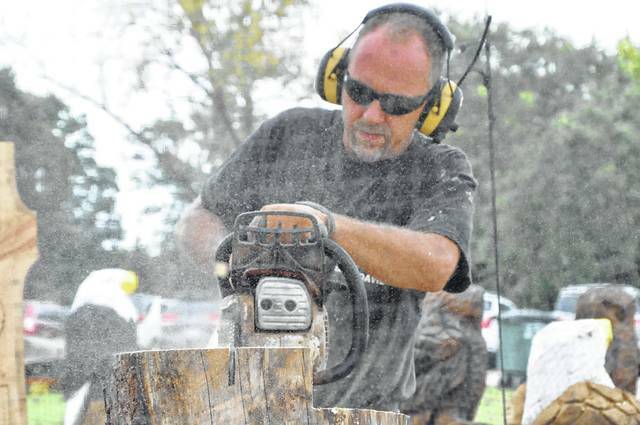 Chainsaw artist David Crego saws through a log that will eventually become a wooden pumpkin Tuesday at the Delaware County Fair. Crego is from Sunbury and has attended the fair before but this is his first year as a performer.